There's little debate that health care in this country needs improvement. Costs are high, paperwork is cumbersome and confusing, and patients can get lost in the shuffle. Some believe technology will drive improvements in health care. But the guest on this episode's podcast disagrees. Aneesh Chopra was the first ever U.S. Chief Technology Officer serving under President Obama. He says technology's role isn't to drive change, but to enable doctors, hospitals and even patients to create change. 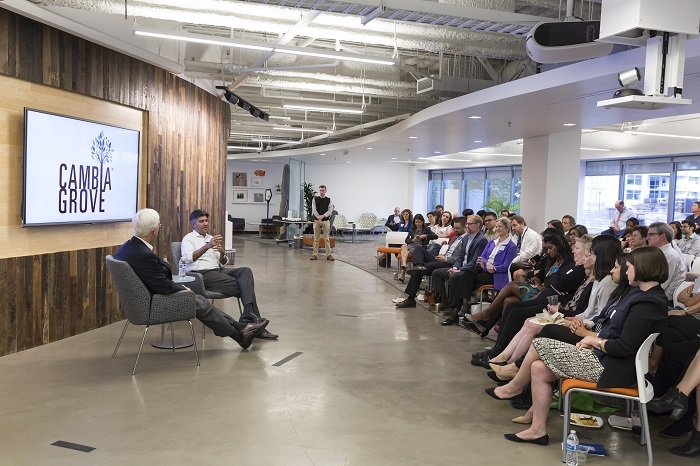 He dropped in for a conversation before a crowd of health care innovators at the Cambia Grove in Seattle. 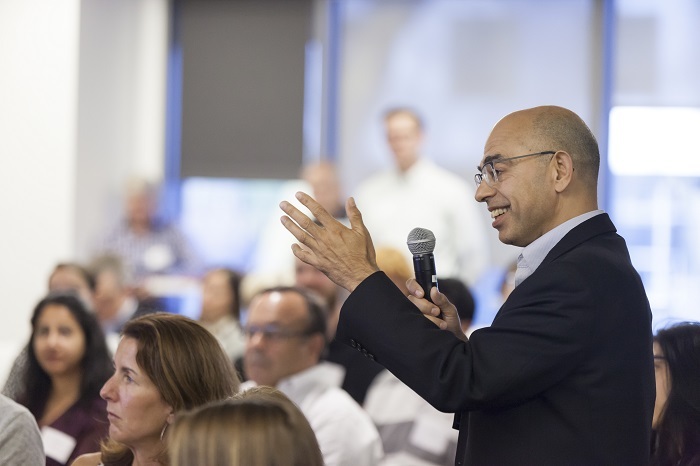 In addition to serving as the first U.S. CTO, Aneesh is now the president of CareJourney. Aneesh was interviewed by Lee Huntsman, President Emeritus and Professor Emeritus of Bio-Engineering at the University of Washington. You can listen to this episode with the player above, on iTunes or on Stitcher, or read the full transcript below. Jeremy Solly (JS): Welcome to the HealthChangers podcast, presented by Cambia Health Solutions, where we share real stories of health care transformation, from those experiencing it and those helping to make health care more personalized. I'm your host, Jeremy. There's little debate that health care in this country needs improvement. Costs are high, paperwork is cumbersome and confusing, and patients can get lost in the shuffle. Some believe technology will drive improvements in health care. But the guest on today's podcast disagrees. The interviewer for the event was Lee Huntsman, President Emeritus and Professor Emeritus of Bio-Engineering at the University of Washington. Let's hear this conversation. Aneesh Chopra (AC): So depressing. LH: It's all about politics and special interest. And yet, wasn't it President Obama who pointed us to the elephant in the room and says, "Health care costs way too much and it's limiting society's ability to do other things. And we have to fix that." LH: Do people in Washington, D.C. actually appreciate that? AC: Let me start with a bias. You're going to hear generally optimistic and positive statements coming out of me because I'm generally ... I look for the best in people and I hope the best. So I will say things that you might say, "This guy's crazy." Take my word for it. There are two Washingtons. There's the Washington that is the popcorn eating entertainment show. And it is depressing, yet addictive. Then there is an operations side to Washington, where actually, there's a lot more alignment than misalignment. AC: Be optimistic my friend. LH: Okay, I'll try. I'll try. But the overwhelming debate and argument and all the struggle has been to solve one big problem in American health care, which is access, right? LH: But the elephant in the room is cost. AC: So, this is a hot topic and I will be very clear, the Affordable Care Act included many very critical provisions on the cost side. They just don't get a lot of attention. And I would say, chief among them, the legal authority for the executive branch to test new payment models. And if the independent actuary of CMS certifies that those payment models improved quality, lowered cost, then the Secretary of HHS has the authority to make that payment model available for the whole country without—wait for it—going back to Congress for a vote. We have a price problem in health care, and that price problem is getting worse and worse. And there's a political debate about the role of the FTC and antitrust and consolidation policy. The Affordable Care Act didn't quite do much, if anything, on that score per se. But, it did on the volume reutilization side by saying, "We're going to reorganize the payment structure," which has the natural effect of changing what gets utilized. So, if I get a bundled payment to treat someone who has a need for a knee replacement, well before, I might have 50 different widgets. I need to have the replacement, I need post-acute care, I need therapy, I need this service. Now we're going to put all of that into one pot. And if you can better organize the pot and get better outcomes, you get half the savings, we get half the savings. So bundles are meant to reduce the utilization side. We're starting to see some price opportunity that comes mostly from the Medicare advantage side. So the punchline is, there's a bipartisan commitment to move payment to reward outcomes. If we can align the incentives between the physicians, the patients, the hospitals, we can actually get less utilization but better outcomes. And maybe the price piece comes into play in that experiment as well. So, I actually don't think the Affordable Care Act debate, the repeal debate, has fundamentally changed that commitment to keep the value-based care model moving. LH: Okay, so clearly what we need in the big picture is to move health care in the direction of value. LH: So the question is, what are the forces driving change in that direction? Arguably the number one is a change in how health care's paid for. AC: So the tip of the spear in payment reform is the primary care physician. They're probably the highest leverage point. So you might look at this conversation and say, "Hey, let me go to the person that doesn't make the most, but has influence over the rest and say, 'I'm going to pay you more if you better organize the rest.'" Incentive, carrot. Now we're saying, "You've got 2000 patients. Who are the 15, 18, 20 you might want to reach out to because you're reaching out might result in them actually getting better care and potentially avoiding something catastrophic like a heart attack or what have you." That is the desired outcome that we think about the lists of the patients in front of us and how to treat them slightly better. Help me think about the people who are not here, "Oh, well that is kind of new. I haven't really ... I hadn't really come into you know, my mind. Okay, that's new." So, that's the tip of the spear. Now the awkward question. If 2 out of 100 are in this model, you're not really feeling the incentive. Is it 30? Is it 50, 60? We don't know as a society what the tipping point is, but I can tell you, we're trying hard to move as many of those lives into that model as possible. You know the hospitals. This is complicated because ultimately, a debate is we have a lot of unnecessary hospitalizations. So here you have a huge fixed cost business. You want them to reorganize themselves to further the utilization of their very service. And, oh by the way, the thank you for doing this is you get half of what you would have had before. AC: It is really not a good deal for the hospitals. Now, in a market where you've got two hospitals, you say, "Well, wait a minute. I can be more efficient than hospital B. So maybe all those doctors who have got risk, I'll tell them, 'Bring all of your admissions to my hospital because I'll be much more responsive. I'll share all the data with you. I'll involve you in care planning. I'll make sure that length of stay is manageable.'" So maybe the incentive is that hospitals will compete on being, I call it, ACO friendly. That hasn't happened yet frankly, but let's assume it does in theory. Then that might pit hospital A over B in a competitive market where overall demand may fall, but I might see my market share grow. That's a second stakeholder. Pharma, fat and happy, they didn't get a lot of pressure in this thing. That's a bummer. We need to get pharma under control. So maybe we can start to introduce new mechanisms to bring value into the reimbursement process for pharma. And then who are some of the key people left? The ones that I care the most about, Lee, is the patient and their loved ones. And here's my bottom line. We know we have great care in pockets across the country. If a patient was alerted, given their condition, the right doctor to see for the right service, maybe we could get the patient to ultimately get better care even before the rest of the ecosystem comes along for the ride. Because they'll just route around the bad performers. I don't know. There are plenty other stakeholders, the insurance companies, we got all of them. At the end of the day, the biggest bet is on the primary care doctor thinking about the patients that are not in their office that day. And that's the mental map for where we go. LH: I'm hearing two major driving forces. One is changing the currencies. In the current system, the currencies are the office visit and the procedure. That's how I get paid, right? And you're going to tell me that I don't get paid by the office visit. I get paid by my panel of 2000? That's a big shift. LH: What are the other driving forces? Is technology really a driving force? AC: So it is an enabling force. You said, "driving," and I want to be mindful. 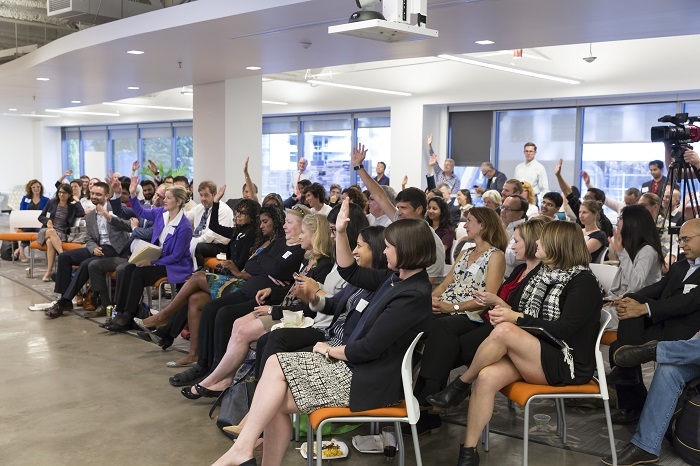 I was CTO so you might presume I'd come into this room to say, "Tech is the answer." Chest thump. Woo hoo. I want you all to understand I was never on that team. My bias is that it's in service too. Let me share an anecdote. Early in my tenure, I visited the Washington, D.C. VA. And they showed me a graph that looked like this. How many veterans have their blood pressure under control? Here, was in the twenties. Here was in the eighties. And the delta in time was a few years. Health care does not move in a hockey stick. "Tell me more, Washington D.C. VA. What say you to this magical amazing thing." They said, "Oh. We turned on a switch in a VA electronic health record." I said, "Tell me more Washington, D.C. VA."
They said, "Oh, we decided that every physician should collect blood pressure and share it with the mothership." "Well, which physician do veterans see more frequently than any other?" It's a sad story. It's psychiatry. AC: How frequently do psychiatrists take blood pressure readings? They started taking blood pressure readings. So, a hypertensive patient that was in a psychiatric visit had their blood pressure read and it was immediately combined with their longitudinal record. And then a decisional alert said, "Oh. Please ask them to visit internal medicine before they leave today." So the psychiatrist didn't fundamentally change their behavior. But the result of it was a heck of a lot of people that were coming in for more frequent visits were flagged earlier. And if you follow Dr. Tom Frieden, the former head of the CDC, now launching this amazing initiative with the Gates Foundation and others to say, "Hey, look, if we had blood pressure control, we could eliminate a million heart attacks in this country." I would argue that that decision in the VA to flip that switch ... Now by the way, what was it that happened in policy as a result of that? Doctors got mad, but we made it a meaningful use requirement that you had to record the blood pressure in every visit. To my friends in the physician community who get irritated, I get it. But it's not that big a deal and it saves lives. And that's why it happened. To give you some context. LH: Technology's the enabler. That suggests that technologists need to be paying attention to these drivers and these changes. LH: So let's talk a little bit more about the directions you see going on and how then the innovation community could help it all happen. AC: Trend number one: the path to establishing a longitudinal health record runs through our patients. That's a theory that I'd love for all of us to hypothesize or test. But that is what I've concluded after a decade or so in public service witnessing every other method. Which is trying to get hospital A, hospital B, doctor C all to open up their records with each other when they're competing and trying to like ... You know, there's a term of ark for this Lee, it's called leakage. "This is my patient, and now they've gone to your service, that's leakage." AC: "I don't want leakage. I want keepage." AC: So okay, that model means that we've got this inherent headwind on moving data for purposes of assembling the record to help that primary care doctor pick the list of patients. However, who has the legal right to pull their records out of any given hospital or doctor's office? HIPPA gives that right to me. We have something in HIPPA called the Individual Right of Access. So today, operationally, it is like evil incarnate to give patients their [records]. I mean we had launched this campaign, the “Get My Health Data” campaign. We asked people on Twitter share your stories. "Oh, my hospital made me go into the basement. The water thing was dripping on me. I filled out four forms. Then they sent me a box of my paper records, 80% of which was just gobbledygook from the CCD files. And then they said, 'Thank you. Here's a $600 bill.'" All these stories were coming out of the woodwork. And it was like, "Whoa. This is super wrong." So the path, the reason it's now a path is first of all, we've woken up to the fact that that's a legal right. And then the engineers said, "Aha, if it's a legal right, what does the legal right say?" The legal right says, "The consumer has the right to a copy of their health records in a readily producible format." And I must say this, all the vendors, many said, "Let's do this together. We're not going to compete on how easy it is for the app to get the data. Let's get to an industry standard and let's make that happen." Now what's funny is, the technologists have reached consensus and they're starting to ship the technology to do this. So driver one, this is now coming into the muscle mass of the economy. Driver two, it will be inhibited because doctors in hospitals don't know to turn it on or some may not want to. HR vendors that are certified and the ones that are today are Epic, Allscripts and Greenway, have said that their customers, "You're welcome to turn on the meaningful use requirements for Stage 3, the API rule." And how many hospitals on Epic, where they have a published website, have turned on this service? It's been available since December. 35. They have a heck of a lot more than 35 that are customers. So driver number two, the headwind. Tailwind, the engineers have come to the rescue. Headwind, the folks that are supposed to turn them on, aren't turning them on. AC: Let me question your premise. AC: I'm a Steve Case disciple. And he articulates a vision that I agree with whole-heartedly which is the Internet economy has had three chapters. Chapter one was the plumbing era. So if you made routers, servers, hardware, you made a boatload of money. The second wave is the era of native Internet applications. Google, Facebook, Twitter, et cetera. And that software has had remarkable returns. But we're entering this phase where now, it's what I think the assignment that I was given by President Obama is tech-enabling something. We want to modernize our infrastructure, our health care, our education, our financial sector. Regulated sectors of the economy that have not had the same benefit of the pure Internet, the consumer Internet and the previous chapter of the hardware. So I would argue, it's not a unique digital health phenomenon. I would say the minute you bring tech-enabled solutions to any of the regulated sectors, writ large, you've got to find a thoughtful way to integrate those technologies into a broader offering that meet whatever regime and business incentive and world that operates. And that is super-exciting for the globe, because what are the sectors of the economy that have the least productivity growth? It's the regulated sectors of the economy. I'll give you a small example. In Virginia where I come from, we take standardized tests in elementary school and up. I have two daughters and a son—they will take 1000 test questions by the time they graduate. Each test question has been vetted and mapped to a curriculum framework that is a particular knowledge object, a standard. When I, today as a parent, get my kids' reports, I see the aggregate sum of how they did. And society grades the school on the collective results. If I could subscribe to my raw data feed at the individual question level detail mapped to a curriculum standard and I gave it to the Khan Academy, might they provide videos that are unique to the areas that my kids are struggling with to help them close gaps and proceed? How many school districts have opened up an API for families to connect to the Khan Academy to produce said videos? The engineering for this is trivial, as is our description of the patient app in health care. Yet in both sectors, there are headwinds that are non-technical that are getting in the way of an obvious way to bring value, harnessing the power and potential of the Internet. And so that to me is why public policy is going to play a critical role here. And we certainly planted the seeds -- I don't want to say we did nothing, obviously we did a lot -- but they haven't taken hold for lots of factors we could get into to. But your statement that this is not a quick fix for the techies, that's true. But I'll say this, the amount of talent ... With all due respect, if you're the best AI mind, the job you've been hired to do is tag photos. And that is lovely and I welcome any ... It's a delight for me to find the photos with my wife in it and have that be its own filter. It's a delightful experience, so thank you for the AIML teams. But for many on those teams, it's not as rewarding. So they're finding this opportunity to dip their toe into health care. And there's like this giant recruitment push to bring that talent into health. And they're not looking for a quick win. They're looking for meaning. And that is extremely exciting. LH: Give us whatever pearls you might have for innovators as they think about this remarkable complexity of the intersection of science, technology and this beast we call health care. AC: Yeah. Study the question before you invent the solution. LH: No, it's pretty fundamental and it's surprising how often we fall to do it. AC: I will say the number of people that would say, "Aneesh, Aneesh, Aneesh. Let me tell you what I've done with this widget." "What problem are you trying to solve? And how is this widget solving it in a way that the previous way didn't?" "But my widget is awesome. It's block chain enabled. AIML." No offense. It's wonderful and I love the spirit and enthusiasm. But eye on the prize, people. Eye on the prize. What's the problem I'm trying to solve? And how might this be better demonstrably than the alternative? JS: That was Aneesh Chopra, former U.S. Chief Technology Officer. He spoke with Lee Huntsman in the Cambia Grove in Seattle. Thanks for listening.